The TOTO Supreme II Washlet+ C100 one-piece toilet and bidet system features an aesthetically pleasing silhouette with all the wash and dry features you need to take your bathroom experience from mundane to marvelous. 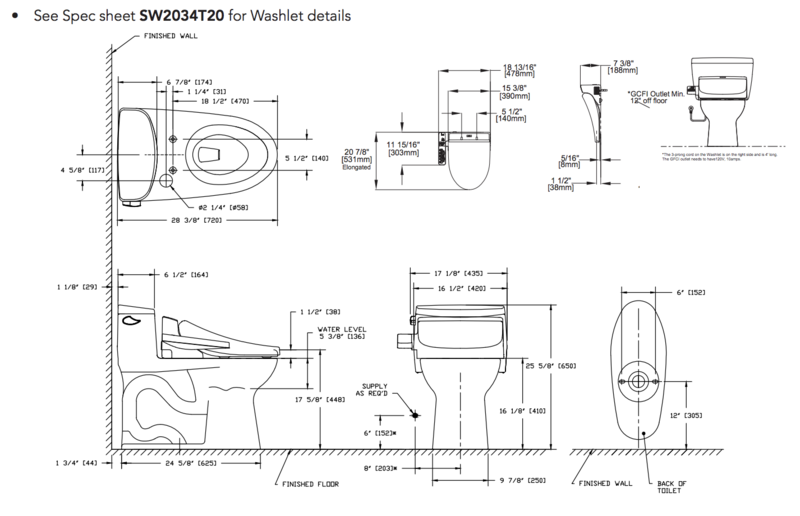 TOTO’s Supreme II toilet is specially engineered to hide the water and electrical connections of the C100 Washlet+ included in your purchase of this system (keep in mind that this particular C100 washlet is only compatible with TOTO Washlet+ toilets like the Supreme II). The Supreme II has a powerful single flush that employs TOTO’s famous Tornado Flush System, along with 1.28 gallons of water, to sweep waste away. Premisting, which coats the bowl in a thin film of water, and the bowl’s CeFiONtect glaze discourage residue from sticking to the bowl for a cleaner overall unit. The C100 Washlet+ bidet seat provides all the basic wash and dry features you need for a comfortable cleansing experience. The front, rear and soft rear wash modes ensure adequate cleaning no matter the situation, and the oscillating spray option causes the bidet’s nozzle to move back and forth for even greater wash coverage and a soothing overall effect. Users can easily adjust the seat temperature, wand position, wash water temperature, and water pressure via buttons on the side arm control panel attached to the seat, and the C100 Washlet+ even makes it possible to reduce or eliminate toilet paper usage thanks to the built-in warm air dryer with adjustable temperature controls. The automatic deodorizer eliminates unwanted odors, and the energy saving mode helps conserve electricity. Do note that this bidet seat uses a tank system to heat the wash water, meaning it keeps a finite amount of warm water on hand at any given time. Once the warm water in the tank is used up, which can happen if the seat is used several times in a row or if you run an extra-long wash, the bidet seat will switch to using cool water until the tank can refill and reheat. If you’re looking for a one-piece toilet and bidet seat featuring a classic look and all the basic features you need for an elevated bathroom experience, you’ll want to seriously consider the TOTO Supreme II Washlet+ C100 one-piece toilet and bidet system.